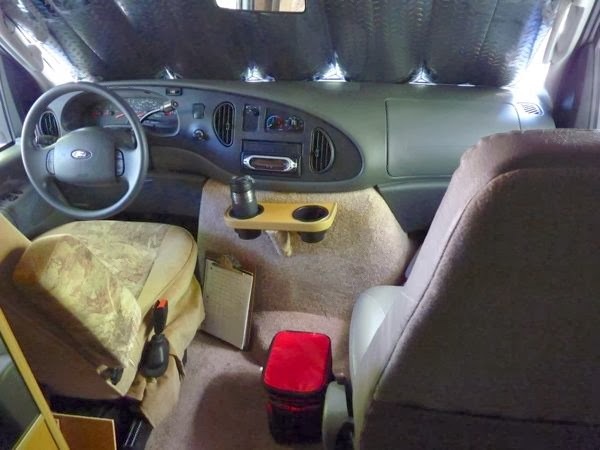 The Cab is a standard Ford E-450 with an instrument cluster, a Sony AM/FM radio with CD player, a good heater and cold air conditioning, electric windows and locks, day-night rear view mirror, a map light, a lighter, and a 12V outlet. Outside are adjustable, big Velvac driving mirrors with convex lens, which can be folded out of the way. The instrument cluster has analog gauges for fuel, battery charge, water temp, oil temp, turn signal indicators, speedometer and RPM tachometer, and a digital odometer; and of course it has various warning lights that appear when needed. The driver’s seat is an electric 6-way adjustable with fabric surface; very comfortable. The passenger’s seat is a replacement installed by the previous owner for his wife who had a bad back. It too is adjustable and has it’s own air suspension. Between them is ample space to walk back into the house portion, and the floor is at the same level. Storage is minimal with a cup tray on the doghouse, and pockets at the bottom of each door. That means sparse storage space for traveling gear. As you might suspect, in an RV, every space is needed for storage. For now, this is how I use the space. On the floor sets a small cooler used to store travel snacks, napkins and miscellany. Leaned against the doghouse is a clipboard that holds a notepad with info for current travel plans. 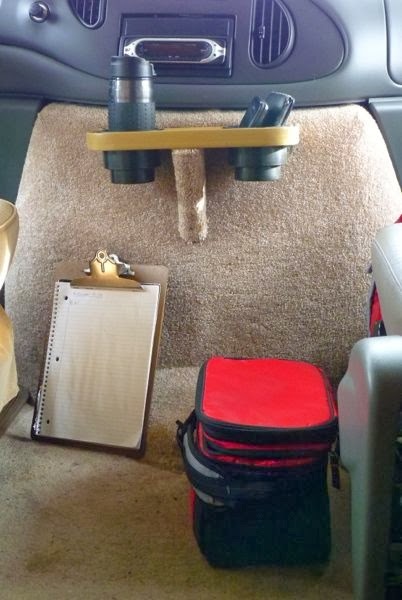 The driver side: the door pocket holds the owner’s manual, tire gauge, a quart of oil, a rag, and a small umbrella. Behind the seat, is a small drying box for paintings with supplies in it, a fold-up reflector screen for the windshield, a portable electric drill set, and sometimes my camera, which makes it handy to grab when a picturesque scene suddenly appears while traveling down the highway. The passenger side: the door pocket holds a California duster brush for briefly cleaning the exterior, and a rag. On the floor, between the seat and door, is an extendable handle with wash brush, and a large umbrella mainly used when painting on location. In front of the seat sets the tripod and backpack loaded with painting supplies. 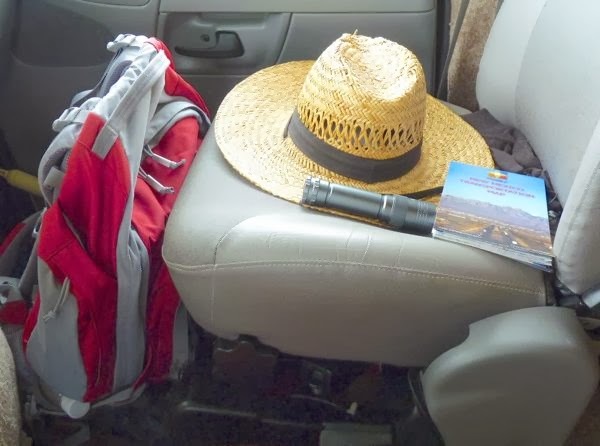 (see Painting Kit) On top of the passenger seat, are a wide brim hat, small LED flashlight, and maps for the trip. This storage area can be greatly improved and will be modified. 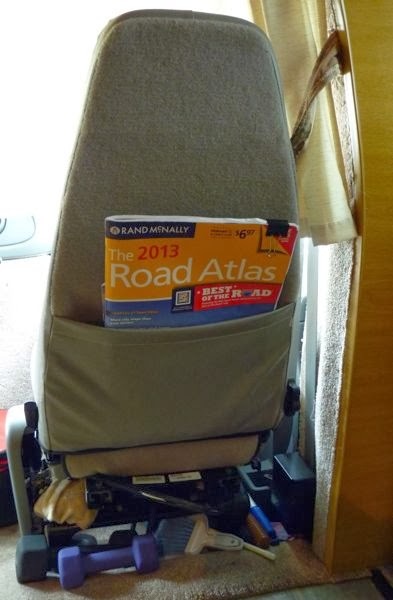 There is also a pocket on the back of the seat that holds road atlases. Under and to the rear is a small whisk broom and dust pan, a rag, a duster, and two dumb bell weights for exercise when I get around to it. 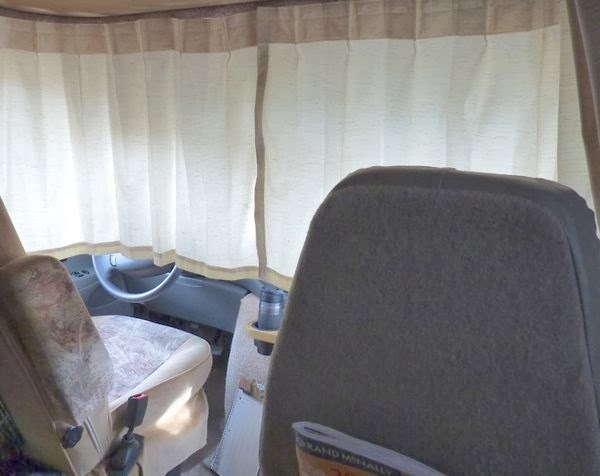 A privacy curtain pulls around and covers the windshield and side windows. It is on a track, and slides to the sides to stow when not being used. There is also a vinyl exterior boot that covers the windshield and both side windows. It can be used when staying still for longer periods, and it blocks the sun and provides a little insulation. During very hot or very cold weather, to provide additional insulation, I suspend a comforter over the opening between the cab and house. It makes heating or cooling the interior much easier. Note the fold-up lawn chair that helps hold it against the frame. 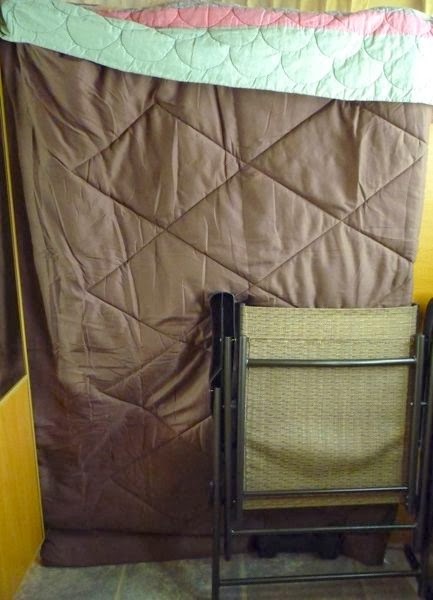 When traveling the chair and loft ladder lay flat on top of the bed. So far I’ve not really done anything to personalize the cab area. It sort of works. But, I do have ideas to make items more accessible when driving, and to use the space better. Mods to improve the cab area are next on my To-Do list. Looks like a pretty comfortable cab with lots of space. It’s laid out nicely. Yes Brad, it is pretty comfy. But, as I said, there is room for improvement. I had an earlier version of the same rig. You might be interested in a mod I made. I wanted a reading area away from the table, so I turned the passenger seat around to face the rear and added a reading light above it. Yours may rotate freely, but on my Chevy I had to remove the seat belt to make it move clean around. Didn’t matter as no one rode over there, and anyway was only a five minute matter to put it back. It was very comfortable to sit up there in the daytime with the window open and light streaming through the windshield behind me. I made a little magazine rack for between the seats. That’s a good idea Bob; thanks for sharing. I had thought of it, but so far haven’t felt the need. Perhaps a future mod. Just turning it around was good. 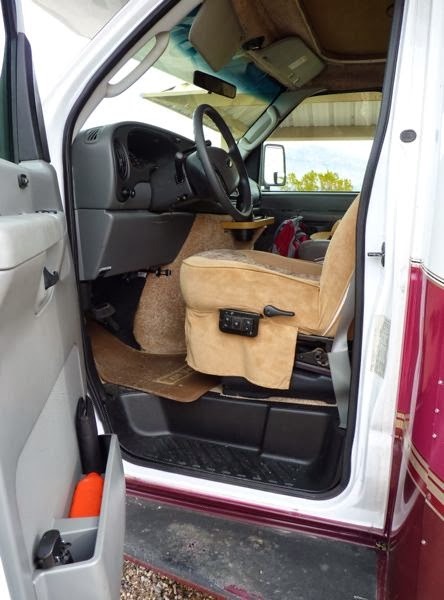 In the end, though, I unbolted it track and all and turned it around to get the full travel of the track, which let it extend further back towards the windshield, allowed a more complete recline, and made an out of sight storage area in the foot well, hidden by the seat back. Nice place to lean back and sneak a nap without actually going to bed.